4th WEEK of CASINO GACHA! Here comes the 4th week Opening sale of the Last Gacha! Don't miss the sale of it for ONLY A WEEK! And Get a special item when you completed the requirements! Also don't miss the Jewel Sales on Michelle's SHOP! So get a chance to complete these jewelries through gachas and this sale campaign! Just got a new announcement from Pico Rock Band's OFFICIAL BLOG! They have a EVENT! and it is their VERY FIRST EVENT since their band started! Are you ready for our first contest??? Well don't expect that we will give you AG ok?? But our contest will be a PHOTO CONTEST!!!! 1. Because you chose Ayame to be the next singer in our video, think of a ROCK SONG!! Remember the vocalist of the song you choose should be a GIRL. 2. Next is you take a photo of yourself in pico with the SONG AND THE SINGER... This is an example of the photo..
Not hard right??? The winner will get the chance to be PART OF OUR NEXT VIDEO together with his/her song that he/she suggested to us... So Join NOW AND GET THE CHANCE!!!!! REMEMBER YOUR PICO ID OK?????? GOOD LUCK and KEEP ROCKING!!! Get updated with PICO ROCK BAND'S NEWS! Casino Area has another new item and only available for A WEEK! [Casino] It’s Showtime in Vegas!! Oh well, so don't miss these new clothes because it's only available for A WEEK! It's actually fun to dance 'Line Dance' with this Suit! Of course, when there is new place, there is a new Gacha! And some other items that you can buy using AG,Token and with your gummies! Another Gacha in Wedding Area~ And this time, it's for a Royal Wedding! Items are really cool and looks so royal but the wedding dress id Blue. I prefer that when it is royal, the color should be red. lol. Well anyways this is cheaper than the other wedding gacha! Just 50 AG per spin! And get these items when you complete the requirements! Also, did you bought the surprised wedding boxes? If they are already ready and you're just waiting for 29th, well let me show you the hints of these special surprise items! Aren't these items are so exiting to have? So good luck on collecting the surprise boxes before June 29! Well, Zye and blondy visited me in my room and then some of their friends followed them. It was nice to meet and talk to them~ They are so friendly! After I fixed my room, we went at Reversi place and I played together with zye XD Haha! This is the first time I played with someone in Étoiles in reversi! And it was fun! Look on the board, the white circles pattern is Z means Zye? Lol, Zye noticed this and he looks so glad lawl. Look how sweet my babies are! Aren't they cute? [3Days ONLY] Weekend SLOT Campaign and SALE!! Another Slot Campaign for you Picos! This is the 3rd time of Slot win 5x allotment and it really helps everyone! Pico is getting on their way just like Pigg and I think it's actually a good thing. So don't miss it! You could also see our mom, Yellow! Étoile somewhere in slot but she's AFK, auto clicking again haha! Also, Don't miss the Classy Locomotive Model SALE! [Casino Cube GACHA] Week 3 starts Today!!! Just got an announcement from Anthoni of Casino Lounge! The Blue Gacha starts today! And just like the past 2 gacha, this week gacha is on sale too! So don't miss it! Just like on Ameba Pigg, the Dice Cubes and Shining Crystal Spades Cube are on Pico too! Yay! Isn't look so cool? Also, this week's special item is High Grade Celebrity Table/bl! This item is not available on Ameba Pigg so you better don't miss it! So don't miss it's 20% off for only a week! Good Luck! [AG Campaign] Get the Special Wedding Items! Get a free item through purchasing 500 Ameba Gold! Limited only from June 20-28! Please take note that you can only get this item on the designated time only. [Invite Event] Ask Your Friends for Wedding Items! There is another campaign for facebook users! Send your friends of these request and get a special item! If you need a help, don't hesitate to send us your requests. -Until June 30. [Limited Time ONLY] It’s a Wedding Hall! I REALLY LOVE THESE ITEMS! I saw this on Ameba Pigg and just this morning, Mia show me her pic with someone in wedding dress with her groom! It looks so great! Very FRENCH! 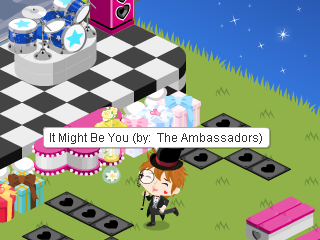 *0* Specially the Groom's outfit on pigg. THESE ITEMS ARE REALLY COOL! SO YOU BETTER DON'T MISS IT! We have decorated the Sacred Hall to a Wedding Hall! Come come out this area! Limited furniture are sold ONLY in this area! Of course, this area is out only for limited time! Father's Day was dramatic. Many things happen and yeah, everything went fine. We had some dramas and I found my father was... cute. I was pretending that I didn't know that it was Fathers Day and telling him we don't have to celebrate. But, behind that... Mia and I Prepared something for our dad. When everything went fine, we had a party inside my room 2 where our surprise is and Yellow was there too! We were happy family! White! Étoile, our greatest Dad ever. Even though we are just in a Virtual World, we are treating each other as a family, fair, just like normal. We've been a family for 8 months and we're getting better and stronger. Trust and Love. Yeah, that's what we have. And White! Étoile, who's always there for us to help and support even though we're not always together because we have our own worlds, but once we are in one place, we are one is the only dad we have from the start and no one can replace him, what ever happens. Hello Guys! Check out our new blog about Pigg and other Ameba Help! We decided to make a new blog to make our posts clearer and better with it's definitions. 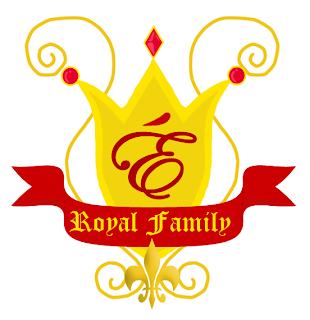 Means, we will stop on posting here in http://etoile-sisters.blogspot.com/ about Ameba Pigg Updates and tutorials and maybe only our life there and memories there. We are also planning to move the helps/tutorials we posted about Ameba Pico and post it to http://etoile-pigg.blogspot.com/ instead, but still we haven't decide it yet. 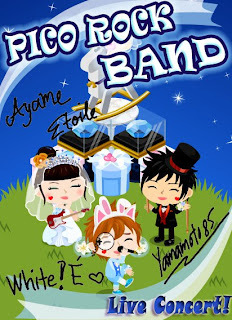 Ameba Pigg X Pigg Life!